Is a meal plan service right for your family? Posted 4/14/2018 7:33am by Tim Livingstone. I have a doctor friend who introduced me to The Blue Apron in the US several years ago. I've followed the evolution of the meal plan or meal kit service closely since then. Should Strawberry Hill offer such a service to our customers? How can we stay competitive and best serve our customers? For those who may not know, a meal kit service is a service where you choose the type of meals you want online then a company packs all the ingredients in a box and ships it to you along with instructions on how to cook the meal. Here are a few observations I'd like to share with regards to such prepackaged meal plans. They can be an interesting and a fun experience. Who doesn't like trying something new and getting a package in the mail? On the other hand they are quite expensive and historically people try them a few times then stop. Rarely are they a long term solution. When you think about it, the food may be Canadian but it is most likely not from your local region. I've never been asked to grow food for one and I don't know any local farmers who have. Most plans do not offer organic, and you don't know who grew the crops or raised the livestock. In addition the shipping cost is going to be a minimum of $10 and probably much more as in $20 - $30 or more for every box. Even if you don't see this cost itemized, do you want that much of your weekly grocery bill ending up in freight? In the end a prepacked meal box is going to have a large percentage of what you pay going to freight, packaging, and portioning while very little will go to the farmer or your local community. 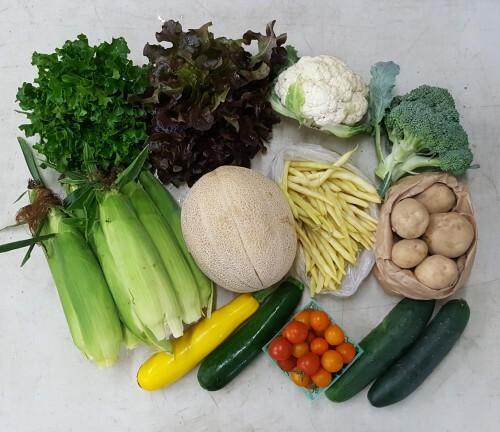 For these reasons we at Strawberry Hill Farm have decided not to try to mimic these plans but rather to continue to offer fresh, local, organic produce at a reasonable price with the addition of weekly preparation videos to accompany each box. In order to serve our customers better and help you all utilize your veggies, we are planning to offer a brief tutorial video each week through social media and our website that will come the same week you get your box. In this video, one of us (Kirsten, Nollie, or myself) will explain what is coming in the box that week and how to utilize everything easily and effectively. We hope that this addition will help you to learn about and eat more fresh vegetables. So in summary, by all means try out a meal kit or plan and enjoy the experience, but don't expect it to replace your weekly vegetable box or your trip to the market. Silicon Valley and Amazon invested heavily in these kinds of direct to your door food services but then almost as quickly the funding dried up as investors realized that while these plans are a cool idea, the customer retention (those who re-order consistently) was exceedingly low. The long term viability of these programs is questionable due to the high cost of freight, packaging, and the amount of effort involved to get them all portioned out and to your door. Now on the vegetable box side, the biggest complaint or reason people do not sign up again for a veggie box program is because of waste. Some people don't know what to do with all the veggies or have weeks when they are too busy to deal with them. This is the reason we are introducing a weekly veggie video to explain the contents of the box and ways to use the veggies easily and effectively. Recently we have watched a number of cooking shows. They are fun to watch but difficult to put into practice because the veggies and meats they use are not typically in our home. Imagine the fun of getting a box with a tailored video that matches that box. Both the product and information at the same time! Remember to sign up for your veggies for this summer. Go to the Sign Up page of our website or click here to complete your sign up. We look forward to seeing you again this summer and working together to cook and eat healthy meals. As always, we welcome your thoughts and feedback.